Peel and deseed butternut squash. Finely dice butternut squash, carrots, and celery. Peel and finely dice onions and garlic. Wash and chop kale. Pluck herb leaves and finely chop them. Heat olive oil in a large pot over medium heat. Add onions, carrots, butternut squash, and celery and fry for approx. 5 min. Add garlic and fry for another approx. 1 – 2 min. Add tomato paste and chopped herbs and keep frying for approx. 3 min. Deglaze with white wine and add vegetable broth, canned crushed tomatoes, and bay leaf. Let simmer for approx. 15 min. Add kale, canned white beans, and ditalini and let simmer until the pasta is al dente. Season with salt and pepper to taste. 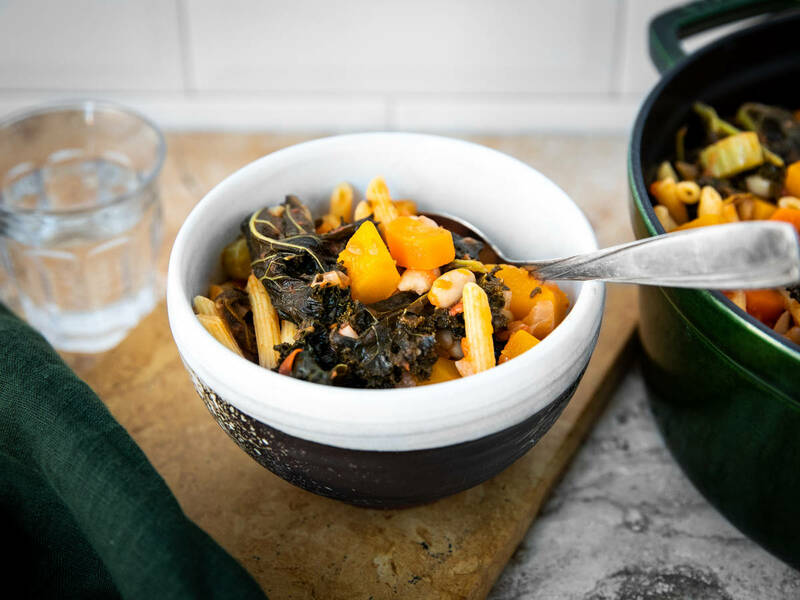 Remove bay leaf and drizzle the minestrone with olive oil before serving. Enjoy!